342 pages | 30 B/W Illus. Industrial production and consumption patterns rely heavily on the intensive use of both renewable and non-renewable resources and the consequences for the environment can be serious. Following a long period of time where the profit incentives of firms have prevailed over preservation of the environment and the world’s natural resources, a new consensus has emerged concerning the need to regulate firm behaviour, aimed at ensuring the sustainability of the economic system in the long run. 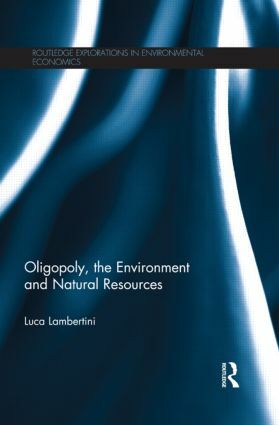 This book offers an exhaustive overview of current economic debate about these topics, taking modern oligopoly theory as a benchmark. The first part of the book covers static models dealing with incentives for green research and development, Pigovian taxation, cartels, environmental quality and international trade, as well as the role of corporate social responsibility, public firms and consumer environmental awareness as endogenous regulatory instruments. Then, the author moves on to examine the role of time while drawing from optimal control and differential game theory. This opens the way to the discussion of fair discount rates to ensure the welfare of future generations, as well as the long run sustainability of production and consumption patterns. Luca Lambertini is Professor of Economics and Head of the Department of Economics at the University of Bologna, Italy. Routledge Explorations in Environmental Economics was established in 2001 and has since provided a key port of call for leading research in the field. As well as the core discipline of environmental economics, the remit of the series extends to natural resources, ecological economics, environmental studies and environmental science, with issues explored including energy, permit trading, valuation, taxation and climate change. The series is edited by Nick Hanley of the University of St Andrews.